An engagement party is the first true public celebration of your newly engaged status. There is no obligation to host a party, but it is a wonderful way to introduce each side of the family, along with different groups of friends, in order to get to one another in a more casual setting. Engagement parties date back centuries, and nowadays there is no real formal protocol for throwing one. This gives the host plenty of leeway to host any style or budget of party that they want – from outdoor BBQ in the backyard to a Sunday brunch, or from cocktails and hors d’oeuves at the bride’s parents house to dinner in a restaurant, these would all fit the engagement party bill. Just as those different party scenarios would have a different look and feel, so too does the invitations you will send out. 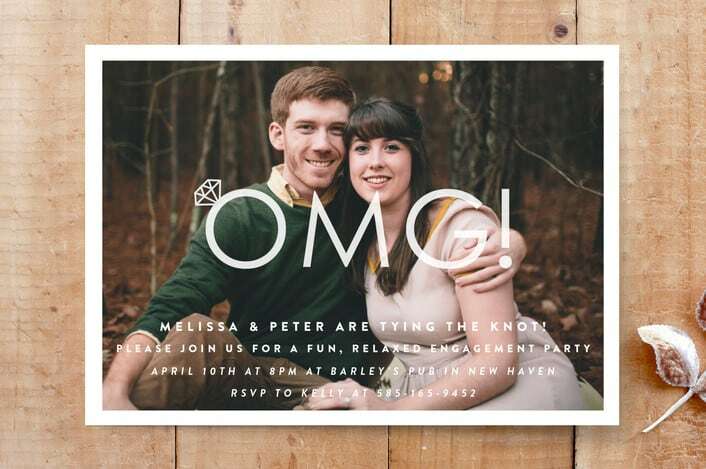 You may be a bit lost for words on the engagement party invitation wording. Not to worry, we’re here to help. Read below! 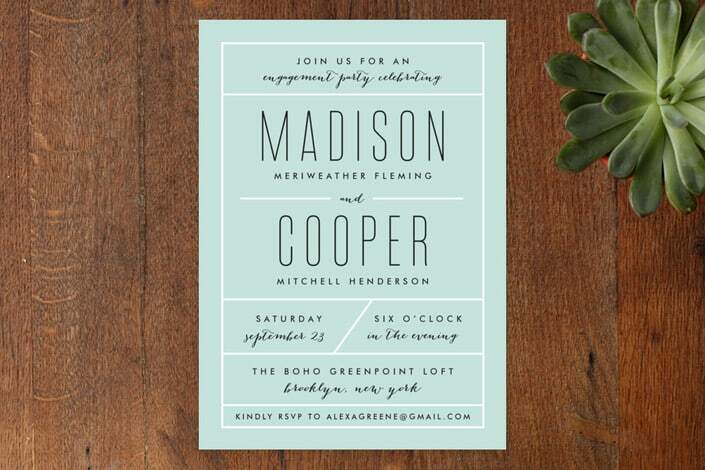 When it comes to the actual wording of the engagement party invitations the wording should be simple. In addition do not mention any of the following items: the wedding registry, the wedding website, wedding date or location. Depending on who is throwing the party, there are certain pieces of information that must be added to each invitation. You may want to also include information regarding any special attire requirements for the party such as a costume, black tie, or summer casual dress. 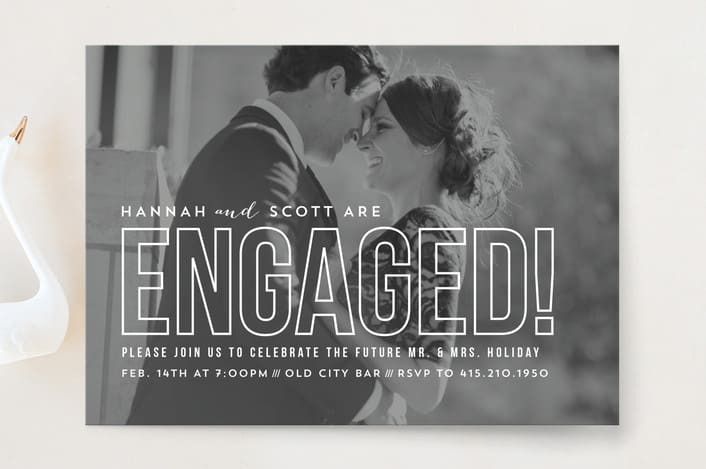 Let’s see a few specific examples of real engagement party invitation wording. We’ve perused the web and collected some of our favorite Love & Lavender engagement party wording examples from our readers and divided them by the style of engagement party. 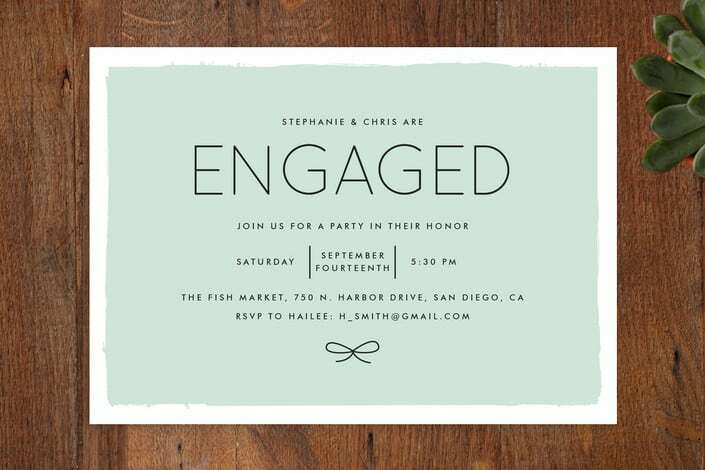 Traditionally, the bride’s parents would host and send out printed engagement party invitations. If the parents are traditional/formal, they may want the invitation to reflect that. 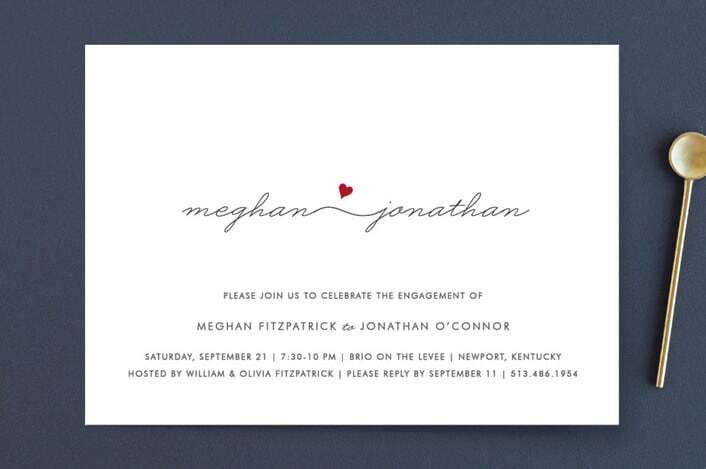 A formal party invitation would include both the title of the hosts and the full name of the engaged couple. Saturday, September 14th at 7:00 p.m. The parents may choose to have a more modern party with a little bit of formality, yet an overall casual vibe. 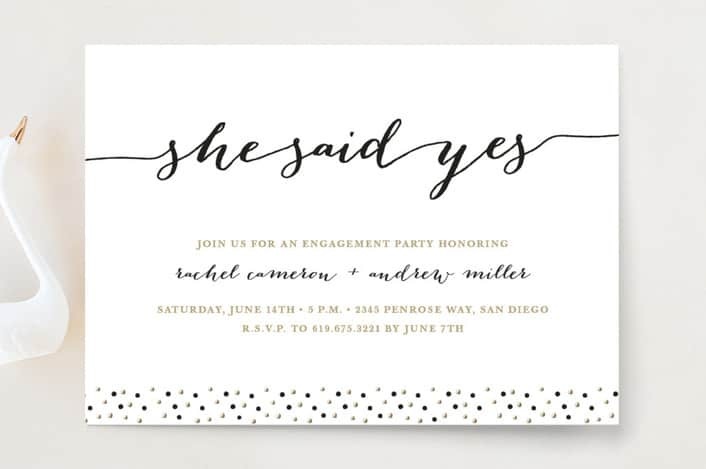 If your parents want an engagement party that has a much more laid back atmosphere, and think formality is a thing of the past, they may choose to send out an invite with casual wording to set the tone for the upcoming celebration. Hannah and Scott are engaged! Justin asked Elaina to be his wife! Saturday, April 19th at 6:30 p.m.
on Saturday, August 15th at 2 p.m. This next example is a great invite example wording if the party is being hosted by a single parent or by someone else such as a close friend. The wording is casual and friendly to reflect the vibe. 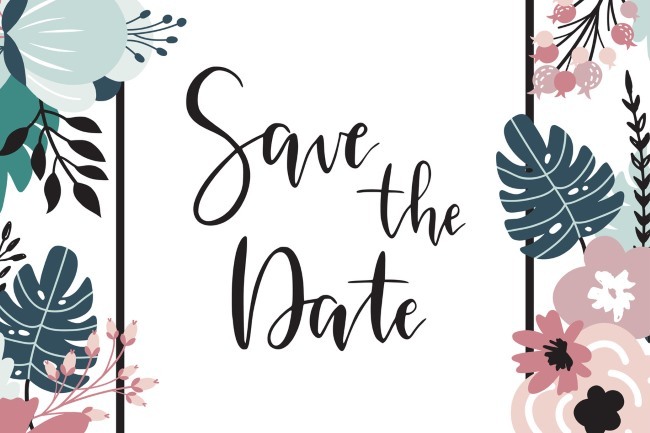 Saturday, May 15th, 2018 at 7:00 p.m.
You may be in a situation where both of the groom’s parents want to host the engagement party together and share the expenses, but they are divorced and have both remarried. 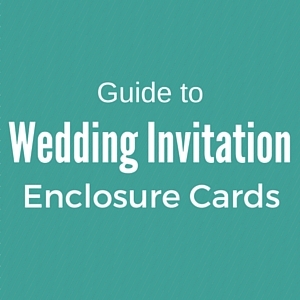 In this case both sets of names should appear on the invite, with the groom’s mother appearing first. Do not use “And” between the names, as this would confuse guests on thinking your parents are still married. May 13, 2018 at 6:30 p.m. If an engagement party is being hosted by a large group of your friends, then everyone should be included on the invitation who is involved. Harper and Thomas are engaged! on Friday, September 5th at 6:00 p.m. Although traditionally the bride and groom would never host their own engagement party, some couples are opting to do so these days. As couples are getting married at older ages, they find themselves in established careers and would prefer not to place any financial burden on family or friends to throw a party. Another option, if you so choose to have the party yourselves, is to have someone else host. If you are going to host your own engagement party, do make sure to add “no gifts” to the invite, as proper etiquette suggests that you should never host a party to celebrate yourself. Although, it does kinda sound like fun! Sometimes an engagement party is thrown as a surprise for the happy couple. In this case, the invitations should explicitly make note of this fact, to avoid the surprise being spoiled before the party occurs. 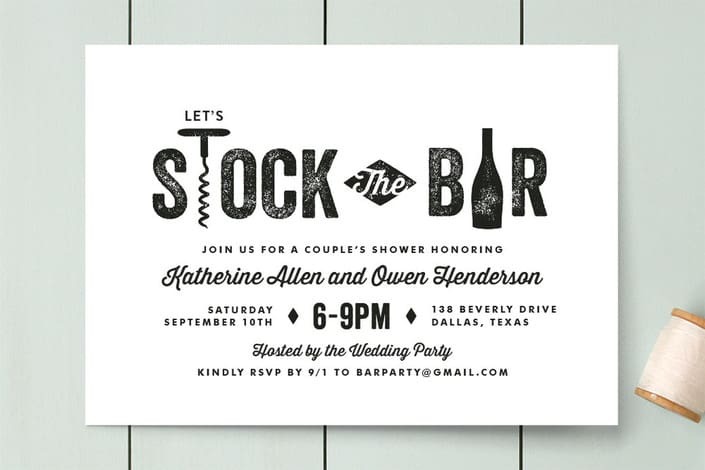 You can add a cutesy rhyme or just make note of it somewhere on the invite. 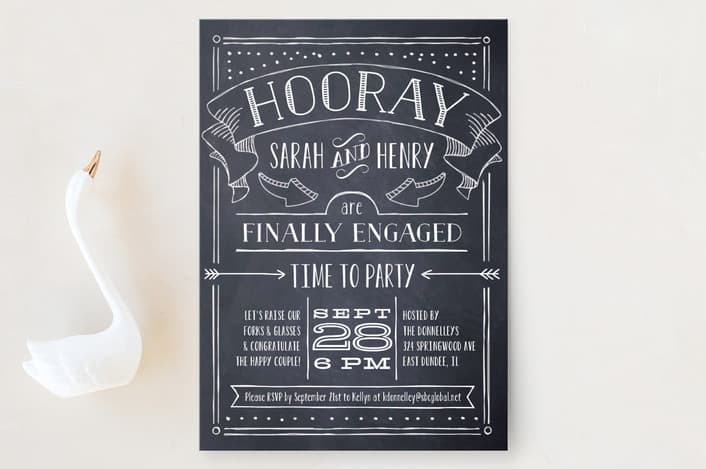 As you can see, there are many ways to word your engagement party invitations. You can be casual, funny, or as formal as you want, as long as it is appropriate for the occasion and the couple. 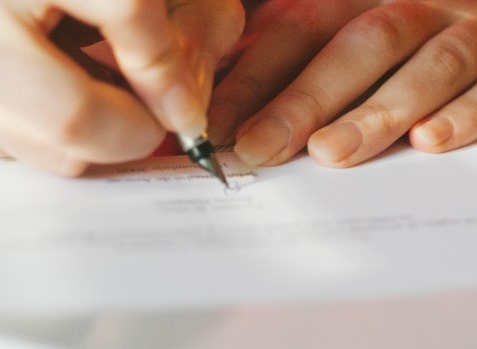 Be sure to include all the elements outlined at the top of this page and you’re good to go! 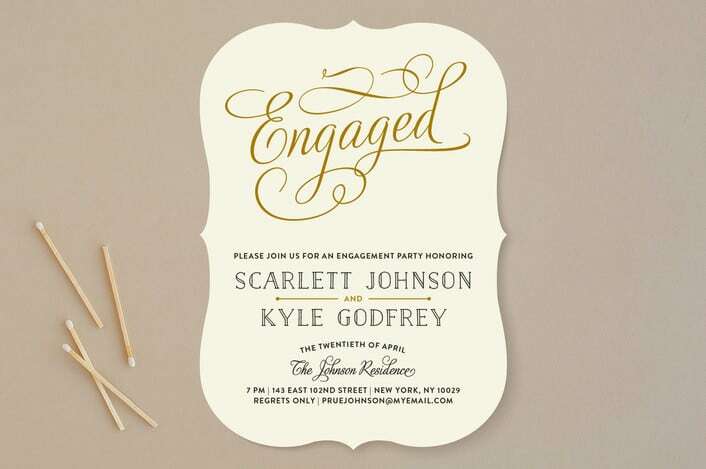 Thanks for taking the time to read our how-to guide on Engagement Party Invitation Wording. Hopefully you are no longer lost for words and you can now get back to business.